Description: Sneak around in the forest driving a super-sneaky stealth prowler. 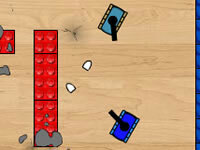 Destroy the enemy tanks but be sure to move quick after shooting because they'll back-track your shots!. Stealth Prowler is a Tank Games. Instructions: Arrow keys to drive, Q to fire..